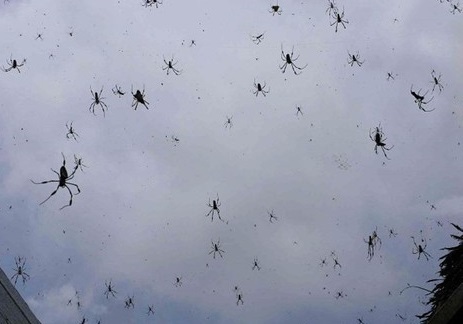 Millions of tiny spiders recently fell from the sky in Goulburn, Australia, alarming residents whose properties were suddenly covered with not only the creepy critters, but also mounds of their silky threads. Experts say that such arachnid rains aren’t as uncommon as you might think. “The whole place was covered in these little black spiderlings and when I looked up at the sun it was like this tunnel of webs going up for a couple of hundred meters into the sky, according to Ian Watson , one of the resident of the place. His house looked like it had been “abandoned and taken over by spiders,” he added. Mystified by the phenomenon — and frustrated by the tiny arachnids getting caught in his beard — Watson did what anyone in his situation would do: He turned to the Internet. “Anyone else experiencing … millions of spiders falling from the sky right now?” he wrote on Goulburn’s community Facebook page. Scientists could have assured the people of Goulburn that their predicament is not without precedent. Similar incidents have been documented recently in Texas and Brazil and nearby Wagga Wagga, another Australian town. According to a 2001 study in the Journal of Arachnology, the spiders will spin out dozens of silk strands at once so that they fan out and form a triangular parachute, allowing the clever critters to catch a breeze toward new ground. When the aerial arachnids land, their silk balloons wind up draped over the landscape. This effect, sometimes called “angel hair,” also happens after heavy rains or floods. Spiders that live in the ground will throw silk “snag lines” into the air and use them to haul themselves up out of the waterlogged earth. When huge number of spiders escape drowning this way, their criss-crossing “silk roads” weave a shroud over trees, grass and sometimes buildings.